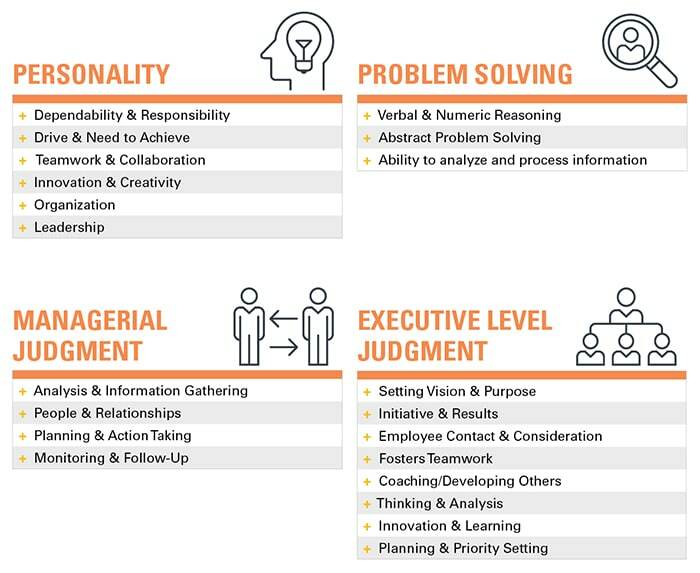 Executive and senior leadership roles require a complex range of skills, abilities, and traits: from leadership and communication to strategic reasoning and long-range planning. At the senior levels, the differences between making the right or wrong hires are momentous. To help organizations mitigate the risk of these difficult decisions we provide a thorough and far-reaching level of assessment, interpretation services, and decision-making support. At senior job levels we utilize a combination of problem-solving, behavioural competency, and leadership judgement assessments to provide a comprehensive review of the potential leader’s skills, capabilities and gaps. To ensure you get a complete, objective picture of each candidate, our I-O psychologists will review each candidate’s results with you – enabling you to make the best hiring decision. Ideal for roles such as General Manager, Marketing Director, Chief Financial Officer, Vice-President of Operations, Superintendent, Chief Executive Officer, etc. Based on the executive position, we administer a battery of assessments that measure the candidate’s personality characteristics, cognitive abilities, and executive level judgement and decision making. Our psychologists prepare a written report of the candidates’ strengths and potential challenges. Our psychologists debrief the results with the hiring team to mitigate risk and help them make the best possible decision. our assessments take the guesswork out of hiring leaders. Make better hires with confidence. Psychometrics Canada has selection solutions that help you make better hiring decisions — at any level, for any industry or situation. Our assessments and advice give you clear and objective information, making any hiring decision easier.